I selected the Honda Degree 250 for my ride. The motorcycle had a faulty odometer and I was not provided with any tools and spare parts. It was probably because I did not inform the motorcycle rental shop that I was traveling out of Phnom Penh. Before I forget, note that it is an offense in to ride with your headlights switched on during day time. Yes, it is not an offense if you ride with headlights switched off during night time. Well, welcome to Cambodia. 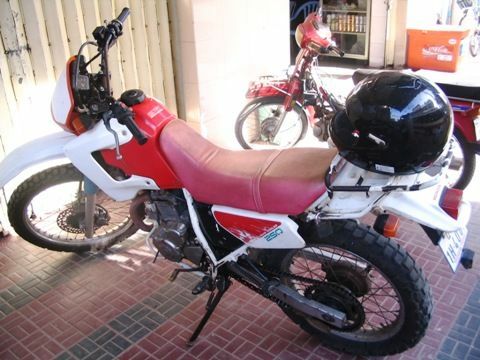 This entry was posted in Cambodia, Motorcycle Adventure Vacations and tagged Adventure travel, Bokor Hill, Cambodia, Honda Degree, Honda XR Baja, Lucky! Lucky!, Motorcycle, Motorcycle rental, Phnom Penh by atticus. Bookmark the permalink. This is normal for Cambodia! The odometers/speedometers do NOT work for most rentals in Phnom penh. If you rent from an Expat shop the bikes will be in better condition, but you will pay $10/day extra. If you give the bikeshop ~20$, they will repair the unit, but they need advance warning. Also- You should tell them that you are taking a longer trip and are planning to go offroad. The can provide intell on the road/trail conditions and ensure that you get a bike that is in ‘better’ condition. Angkor Motorcycles cost just a couple dollars more than Lucky! Lucky! and they promised working speedos/odos. Besides non-working speedos/odos, the bike I received from Lucky! Lucky! was actually in pretty good condition. Bad service, BAD bikes, BAD staff working there. Thanks for the feedback. I guess we better stick with Angkor Motorcycles. Angkor Motorcycles is top notch, I rented form them in october and am going back with a group next month. very flexible and accomodating. and good bikes too.